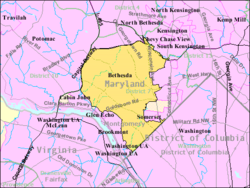 Bethesda is a census-designated place in southern Montgomery County, Maryland, United States. It is northwest of Washington, D.C. The National Institutes of Health main campus and the Walter Reed National Military Medical Center are in Bethesda. There are also corporate and government headquarters. In April 2009, Forbes put Bethesda second on its list of "America's Most Livable Cities." Bethesda is an unincorporated area. It has no official boundaries. The United States Census Bureau says the center is at 38°59' North, 77°7' West. According to the U.S. Census Bureau, in 2010, Bethesda had 60,858 people. ↑ "Factfinder". United State Census. Retrieved 2014-11-17. ↑ Greenburg, Zack O'Malley (2009-04-01). "America's Most Livable Cities". Forbes. Archived from the original on 2012-12-08. Retrieved 2009-06-03. This page was last changed on 28 May 2018, at 13:54.